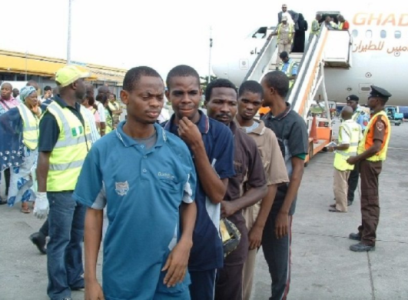 On Wednesday June 21, 2017 the National Emergency Management Agency, alongside other Federal Government agencies received another batch of 174 Nigerians that voluntarily returned from Libya at the Murtala Muhammed International Airport, Lagos. The returnees, who came back aboard a chartered Nouvelair aircraft with registration number TS-INA, are 34 males, 122 females, 10 children and 9 infants. Their return was facilitated by the International Organisation for Migration and the Nigerian Embassy in Libya as they were received at the Hajj Camp area of the airport by officers of the Nigerian Immigration Service, the National Agency for the Prohibition of Trafficking in Person, and the Police.